Aerobics Screwdrivers enable you to remove even DAMAGED SCREWS with ease and speed. This highest quality DRIVER performs like a Philips screwdriver and can remove good and sized screws. GiGa FiT Screwdrivers - Capable to Hold Screws. Unique, Patented Superior Fitting of the screwdriver and the cross or slot in the screw head not found in any other types of screwdrivers. GiGa FiT HEX BITS - The Highest Quality BITS you can get! Best Fit, Best Driving torque and Super Straight 100µm (.004") Max deviation along the whole bit. Important for use with power tools. GFX-4 GiGa Fit Screwdriver, Phillips (+)#2 Single Side - Narrow shaft, 150mm with Quick Insert/Release (Handle can be used with all supplied bits). Why will you like and want to use Bokar-Tokoma Superior Screwdrivers? Because they are the best screwdrivers ever produced. Developed by high precision Japanese Company and till 2007 sold exclusively in Japan. Used by many fames Electronic Equipment Manufacturers. Can not be copied because they are protected by many patents. They are ergonomic and extremely well made. Precisely ground at patented angles to fit the screw slot or cross. All shafts and bits are straight which makes fastening the screws easier than ever. 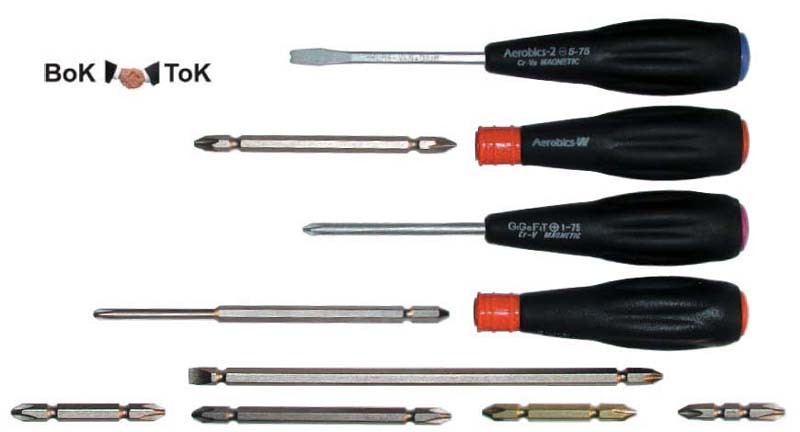 Aerobics arrangement of the screwdriver tip can be found only in Bokar-Tokoma tools. It is virtually impossible to describe in few words how much better these screwdrivers are than anything produced to date by others. Only if you use them (even ones for few minutes) you will understand their superiority. To give you a chance to try We offer now one set per customer at the promotional price.